WOW! Our Spacious, Non-Smoking Villa located on the 24-hour guard gated, exclusive Emerald Island Resort, just under 3 miles to Walt Disney World. Our villa provides spacious 3200 sq ft living space, 7 bedrooms and 4.5 bathrooms, sleeps up to 16 guests with private pool / Jacuzzi hot tub and games room. * NEW décor throughout entire House! Come experience an Spacious, Non-Smoking Villa for your perfect vacation home that fit any size family / families or group sleeps up to 16 guests. The villa with seven bedrooms, four and a half bathrooms includes two master suites, 3200 square feet plus living space for comforts that you would expect. As you face in front of the house you will find a beautiful palm tree and green grass awaits you from the paradise villa. The gorgeous, fresh coat, warm exterior paints invites your welcome as you enter our up-to-date Villa. As you enter the house you will find continuous cozy new interior decors with brand name furniture to decorative fixtures. With an abundance of amenities options, both indoors and out, everyone is entertained. The total of Ten large flat TVs, one in every bedroom, provides convenient access to your liking. The hot tub Jacuzzi also includes a fully screened custom built heated pool with above ground spa/Jacuzzi. As you walk in from the front entry, there is 40" digital cable HDTV to watch your favorite TV shows or play family entertaining Wii games. There is many games to choose from. The elegant dining table room and nook tables sit comfortably for family reunion and friends, for a great meal or snack for kids. The gourmet kitchen filled with new refrigerator, range, microwave, coffee makers, blender, toaster, and an assortment of cookware to satisfy your desires. The modern living room has 50” digital cable HDTV to watch your favorite sports and surf the internet. Video chat face to face or socialize with your friends and families with great pictures and videos of the day. The main floor has king size bed master suite with private full bathroom suitable young to elderly. The new king size bed, mattress, bedding and new finishes bring a cozy feelings. It has direct access to patio lounge and pool. Entertain your kids with a Nintendo Wii gaming console at the family room or have family time at the game room doing billiard, air hocky tables and foosball table. Step outdoors to your very own private patio to refresh and revitalize the day with 4 people Jacuzzi while your kids enjoyed outdoor pool activities. The patio sets and dining is perfect to enjoy Sunshine State weather with the BBQ grill. Enjoy the underwater lighting and separate heating controls for your comfort. 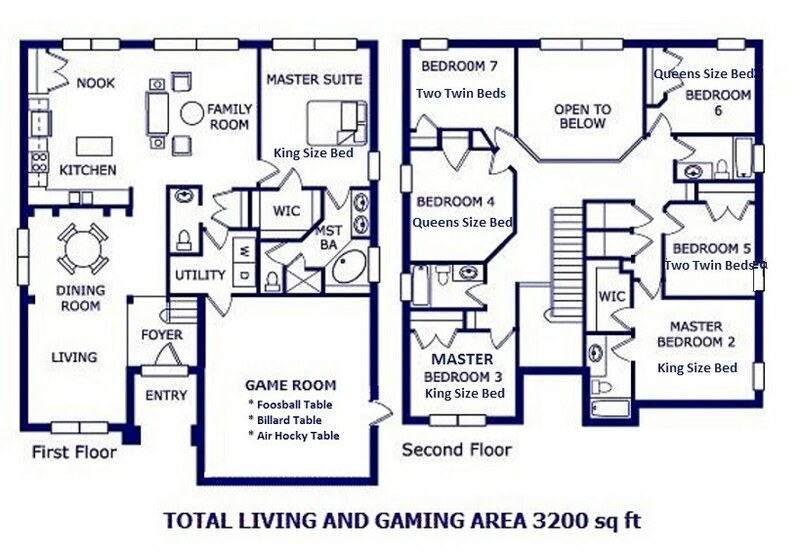 The 2nd floor plan fits great for any size family. It has additional two Master Bedroom with king size beds, two Queen size in Room 4 and 6 and 2 bedrooms fit for younger kids. Our Master Bedroom En-suites on the 2nd floor with Custom King Size beds and matching furnitures will relax for the next day adventure. Whether is theme parks going or golf. Our comfortable beds will ease to sleep. The Two Bedrooms with Custom Queen Size bed fit for for royalty alike. The 2 themed bedrooms, each with 2 twin beds, outfitted with kids design. If you are traveling with a toddler or infant, you can leave the baby gear at home because your Emerald Island vacation villa is baby ready with a high chair, stroller and pack n' play to keep your little one safe. And if you are visiting us with more than one baby, we can provide the extra baby gear that you need.